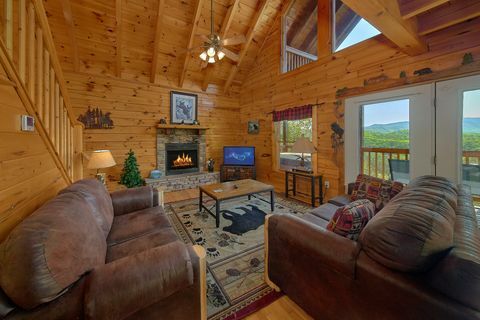 " A Lazy Bears Hideaway" your 3-Bedroom cabin near Dollywood, offers impressive mountain views and a luxury cabin experience for families seeking an authentic Smoky Mountain getaway. 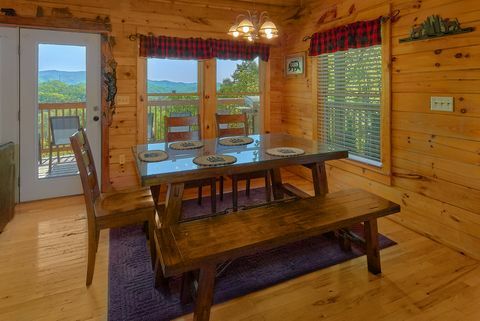 With a comfortable cabin interior, a beautiful location, and unforgettable mountain views, this cabin that sleeps 8 guests gives vacationers an unforgettable getaway for the whole family! 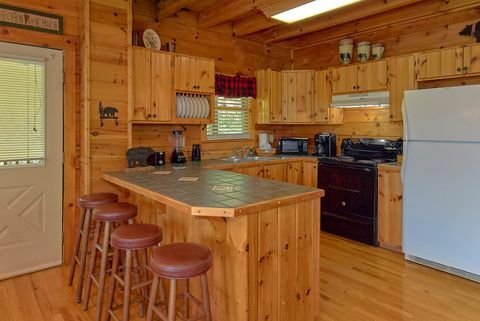 With a barbecue grill, fireplace, game room, hot tub, wireless Internet access, jacuzzi tub, pool table, and more, it's hard to find a cabin with better amenities than "A Lazy Bears Hideaway". 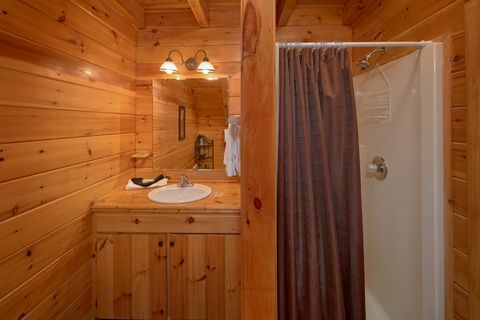 Your Sevierville rental cabin provides the relaxing environment you need to refresh yourself on vacation. 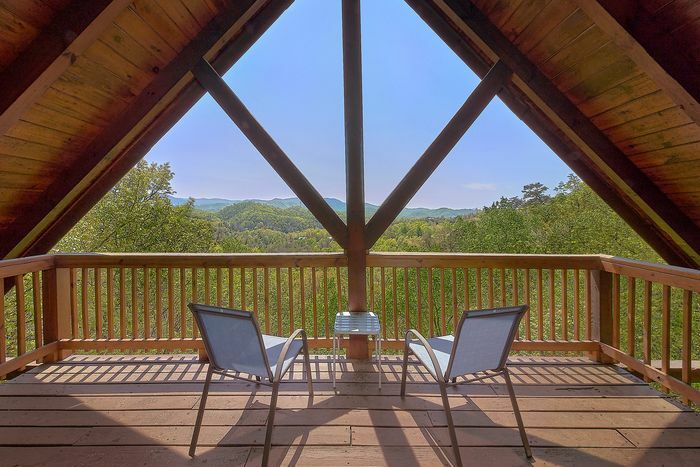 Sit back and unwind by soaking in the hot tub, reading in a rocking chair, or swaying in the porch swing on the deck while listening to the wonderful sounds of nature in the Great Smoky Mountains. 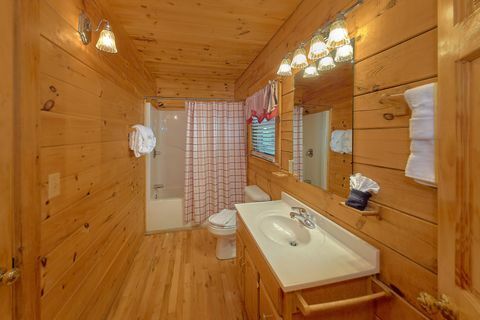 Since this cabin offers you the peace and tranquility that come with stunning mountain views, 4-wheel drive vehicles are recommended in the winter months to access this log cabin rental. 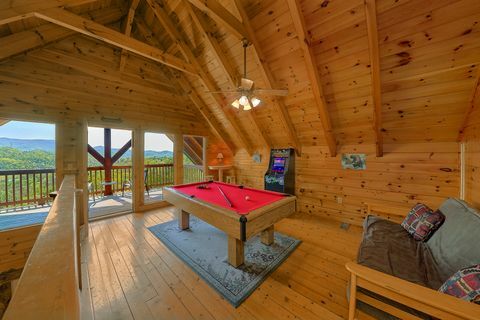 This cabin retreat also offers plenty of entertainment. 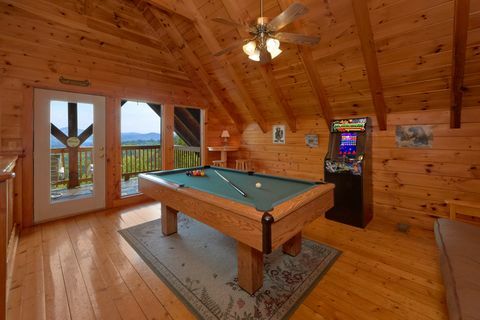 The game room located in the loft will provide hours of fun for guests playing billiards on the pool table or a few rounds on the standup arcade game. 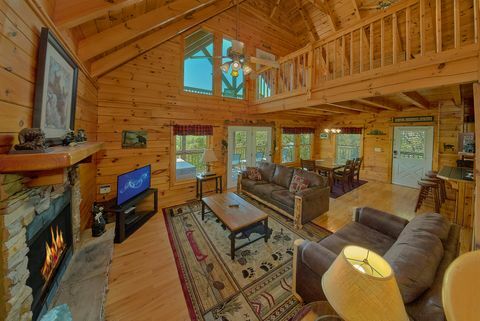 The theater room provides evenings filled with relaxing entertainment. 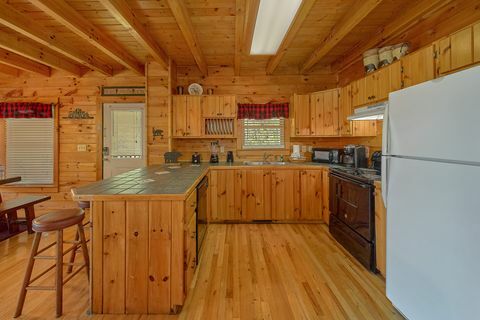 With a great location close to Dollywood and Gatlinburg, this log cabin is ideal for the family that wants to have it all on their vacation in the Smokies. Whether you're exploring attractions in nearby Pigeon Forge, Gatlinburg, or the national park, you'll be thankful you booked a cabin that's never too far away from the sights you want to see! 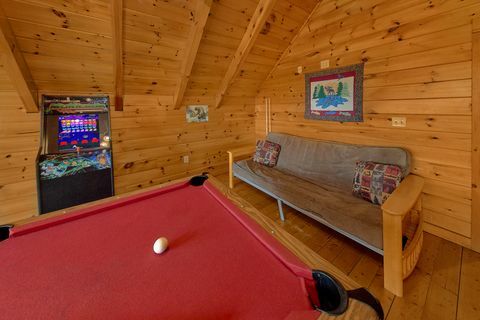 When you return to your comfortable cabin retreat, you'll find plenty of ways to rest before your next day's adventure like watching a movie in the theater room, playing a round of billiards, or just relaxing with family and friends in the living area or deck. 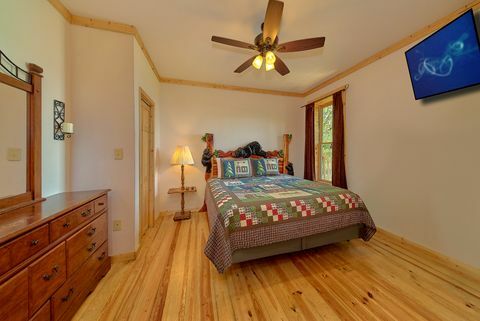 Once it's time to rest up before another day of vacation adventures, your Sevierville cabin with 3 bedrooms offers comfortable sleeping space for 8 guests. 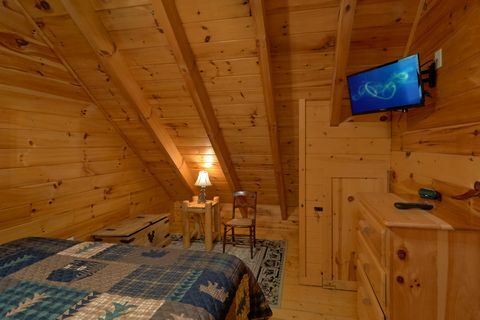 On the main level, you'll find a king bedroom complete with a television for relaxing in the evening with your favorite show. 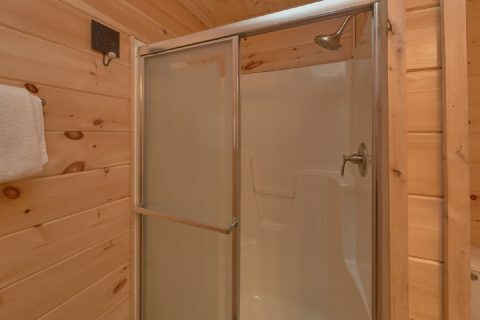 Upstairs, you'll also find an additional king bedroom and a futon in the game room. 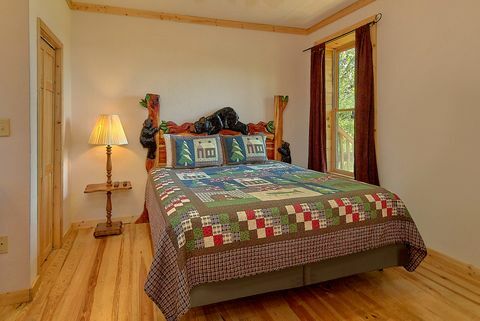 A master bedroom suite on the lower level features a king-size bed. 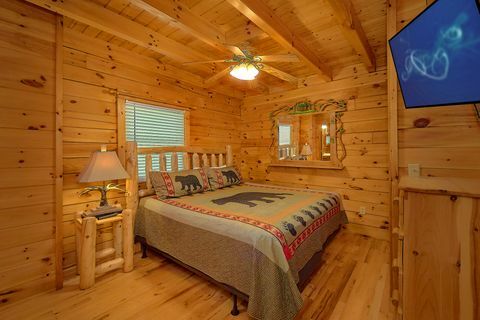 Choose this fantastic log cabin rental or one of our many other 3-bedroom cabin rentals with mountain views for a fabulous family vacation that everyone will love! 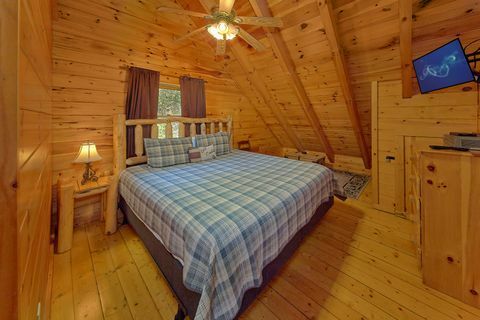 Book online with Cabins USA Gatlinburg to earn "A Lazy Bear's Hideaway" with a special discount online!